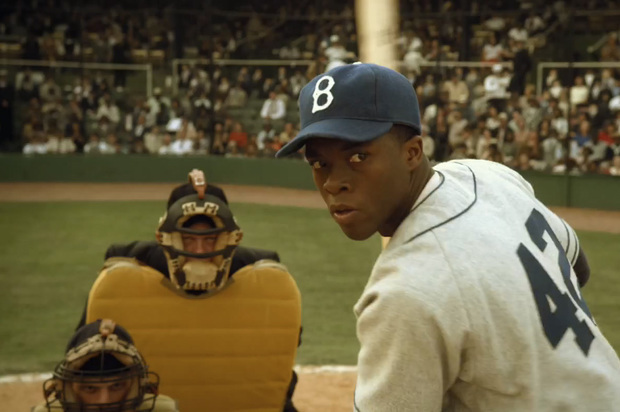 A game performance by Chadwick Boseman cannot overcome every sports, race, and mythic America trope or Harrison Ford’s schmaltzy Oscar-bait bid as Branch Rickey. Brian Helgeland’s script is a bore, and the performances feel like civic duty. If you want to watch a richer, more interesting baseball film with a numeric title, try Billy Crystal’s 61*. Stumbled onto the scene when the Phillies manager is heckling him, snapping off one-liners like a racist Henny Youngman. But then you notice it’s just him, it’s not like his team is in on it too, he’s just out there launching one after another all by himself. Beyond comical.